I am Dr. Cornel West, a teacher of philosophy and a citizen of the US republic. I wholeheartedly support Jill Stein and Ajamu Baraka. And I’m writing to you today to let you know, they have my endorsement – and I know they have your support as well. You know, I’ve never been tied to one party or one candidate or even one institution. And that’s true even with one church as a Christian. I’m committed to truth and justice. I know you are, too. I came late to the Green Party, but right on time; I was a tireless supporter and surrogate for Brother Bernie Sanders … he was the standard-bearer for truth and justice during the primary at a national level, at a highly visible level. Maybe you supported him, too. But once he endorsed Hillary Clinton, I had to endorse Jill and Ajamu. That’s why I’ve put my time, my heart, my energy behind Sister Jill. And I need you to go above and beyond for her today, so we can keep the movement she’s part of, that I’m part of, rolling like a wave of thunder across the entire nation. I implore you to make the biggest donation to the Stein-Baraka campaign as you can today. No donation is too small—think of the Widow’s mite in the Bible—and no donation (up to $2700 per person) is too large. You see, the campaign for Jill has grown exponentially and now needs about $17,000 a day to keep up through November 8. Our goal to start, is to raise $85,000 by midnight on Saturday. Will you help us? Because of about 45,000 prophetic donors to her campaign, we’ve been able to build a progressive movement the likes of which the United States has never seen in modern times. This is our year to make it clear that an alternative movement has taken hold and we won’t quit until we see huge change. We will revolutionize the world. It’s up to us to turn back the forces of evil and work for the greater good. As Sister Jill and Brother Ajamu say … it’s in our hands. 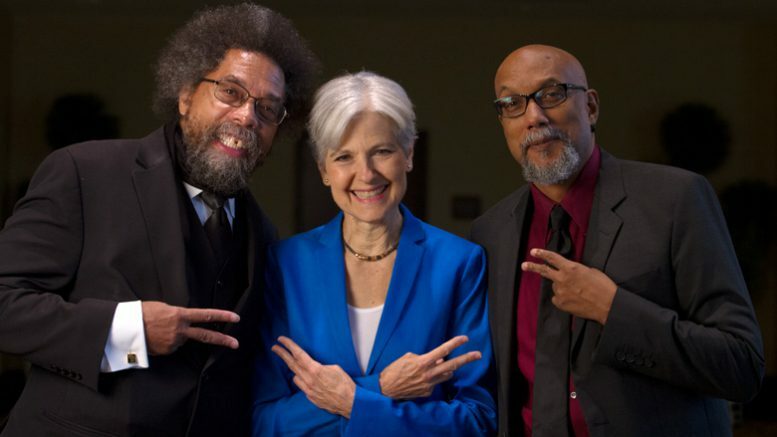 Dr. Cornel West endorsed Bernie Sanders for president last summer and was appointed by Sanders to serve on the Democratic platform committee, author of a number of books, most recently Black Prophetic Fire, now is endorsing Dr. Jill Stein, Green Party presidential candidate.